Invisalign uses a series of clear, plastic aligners to gradually move teeth into a straightened position. The custom-designed aligners apply just the right amount of pressure to gently correct crooked or misaligned teeth. For the best results, Invisalign aligners should be worn for 20 to 22 hours a day and only be removed to eat, drink and brush your teeth. After 1 to 2 weeks, each set of aligners is exchanged for the next set in the series. After just 12 to 18 months of wearing Invisalign aligners, you can have the straight smile of your dreams! Invisibility – One of the primary reasons that patients choose Invisalign is because they do not want others to know they are wearing braces. Invisalign’s clear plastic aligners are virtually undetectable, meaning your friends, family and coworkers will only notice your beautiful smile! Greater Comfort – Metal braces can aggravate the sensitive tissues of your inner cheeks and gums, something you do not have to worry about with Invisalign’s smooth, plastic aligners. Maintain Your Normal Diet – Unlike conventional braces that are stuck to your teeth, you can remove Invisalign aligners whenever you want – this way you can keep eating all your favorite foods without worrying about damaging your braces. 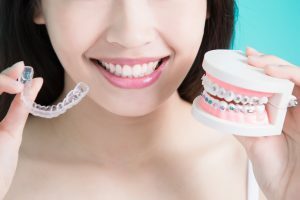 Greater Convenience – Invisalign requires fewer visits to a cosmetic dentist in Ken Caryl over the course of treatment, meaning you do not have to stress as much about taking time off work. Any dentist in Ken Caryl will tell you there is no need to let social anxiety keep you from straightening your smile. Thanks to Invisalign clear braces you can achieve the smile of your dreams without unsightly metal brackets and wires! Led by award-winning dentist Dr. Susan Kutis, Blue Sage Dental offers a wide array of dental services in a comfortable, conveniently-located practice for residents of Ken Caryl, Littleton and surrounding communities. From general and preventive care for families to advanced restorative and cosmetic dentistry, the expert team at Blue Sage Dental can meet all your dental needs. Patients new and old can learn more about the practice by visiting their website or calling the office at 303-973-1112.